Dermarolling / Microneedling / Frequency of melanocyte transfer? Single needling for scars, using "needle abrasion" (very dense and/or deep needling) should be done only every four weeks on the same skin area. Dense needling of acne scars as well. If you use the single needles for melanocyte transfer, it can be done more frequently because it is not as aggressive as the needle abrasion method. Every two weeks should be OK.
As far as I know, copper peptides are not sensitive to light. You can use them every morning but skipping days is also OK. Retin A should be applied (every second or third day is sufficient) in the evening because it is sensitive to sunlight. Long-term application is much more important than frequency. In other words, applying vit. C once a week for years is much better than applying it three times a day for a week. The more is not the better. It's treatment duration that counts more than the quantity of applied product. Dermarolling / Microneedling / 2.5mm dermaroller and 3mm needles for Self Needling. 2 mm long needles reach the deep dermis part of the skin and that is all you need to treat scars. We do not think that longer needles have any advantage. Those reach deeper than you need and could cause heamatomeas. They are used in doctor's surgeries but for us homerollers, it is too long. The skin is only couple of mm thick and there is no evidence that 3 mm needles are more effective than 2 mm. Our single needles are custom-made and they are not all exactly the same length. We do have longer needles so if you really want longer, you can buy them from us. When you buy the single needles, write a comment in the web shop (not in the PayPal part) that you want longer needles. In some cases, scars need long needles. To treat scars, stretch marks or wrinkles, we now sell a 1.5 mm ONE LINER and a 2 mm ONE LINER dermaroller that have only 24 needles. 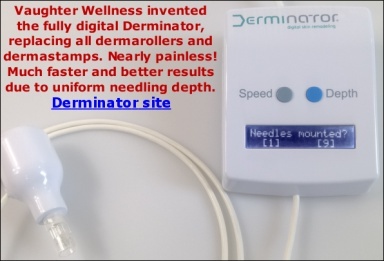 These go deeper than with a regular dermaroller of the same size, because the fewer the needles a dermaroller has, the deeper the needles penetrate. The one-liner is not suitable for acne scars though. For acne scars, the single needles are the best, preferably in combination with a regular 1.5 mm dermaroller. You should stop using the single needle. It is obviously not suitable for individuals with thin skin around and near the eyes. I have needled the wrinkles between my eyebrows and never got anything except pinpoint bleeding that healed very quickly but certain facial areas are clearly too thin for the single needle. The single needles are excellent for acne scars, scars and stretch marks but I have to change our documentation about where the needles should not be used to avoid this problem. We can send you shorter single needles for free or we can refund you for the needles. If you want hand-selected shorter single needles, send me an email and include your address. Our current single needles are shorter - 1.85 mm. Dermarolling / Microneedling / derma rolling, how often should I do it? please help! The problem is that Accutane thins the skin. That is why you get pinpoint bleeding with this size. We have more customers who get pinpoint bleeding with a 0.5 mm dermaroller and it is not always due to Accutane but Accutane is known for helping serious acne and thinning skin. You should certainly reduce the frequency and roll only every 10 - 14 days. You do not seem to have scars, just some pigmentation. Red pigmentation looks temporarily worse because dermarolling or needling makes the skin red for a while but it will subside and dermarolling improves pigmentations in many cases. I hope you won't get disappointed - the mask we sell have a fragrance and they are facial masks, not creams. We've been unable to find affordable GHK-Cu in any other form, but since copper peptides are most useful and most commonly used on the face we thought a face mask would be an acceptable and even convenient way of applying it. We're still trying to find a supplier of GHK-Cu cream. Please don't expect too much of copper peptides - they are to be considered a supporting treatment only. They have been over-hyped by their inventor. We sell "the real deal" as single facial masks so people can try it out cheaply. I don't understand how a company working with such huge profit margins doesn't refund when asked - for any reason. Whenever I get an email by someone saying they did not receive our package I don't even attempt to verify what happened to the package. If the delay is unreasonable, we refund, period. Life's too short to fuss about the small percentage of refunds, and customers have better things to do than haggle over them. In the end, the company with the happiest customers wins because they can rely on word of mouth and don't have to spend a dime on advertising, giving a competitive advantage because it allows working with a tight profit margin. If you did not at least clean the roller before re-using it, then indeed you could now have some weird skin infection. Again, I am not a doctor but I do know that when you roll your face and then not at least clean the roller (like, moving it vigorously in a bucket of warm soapy water) then you'll likely end up with a lot of bacterial growth on the needles. If you merely placed the roller back in its case after rolling, without at least washing it, and later rolled again with it without thorough sterilization, then you can expect heavy bacterial/fungal contamination to be introduced into the skin. However I am still sceptical that this would enter the deeper skin layers and result in anything else but some whiteheads, and only when using long-needled rollers such as 1.5 and 2 mm. As I said, it's a mystery and it would be interesting if you were to decide to send me a picture of your affected skin after all. Don't worry about this thread being bad for business. We sell a roller every ten minutes - we're one of the most popular dermarolling vendors out there - and I don't think an isolated case, of which it does not even seem dermarolling has anything/much to do with it, will deter many from dermarolling. I think this thread contains interesting info and I hope you'll be able to get your problem resolved or at least discover what it is that ails you. After having thought about this and having discussed it last night, all I can come up with is that somehow the long-term use of that antihistamine has caused a long-lasting histological photosensitivity-related change in your skin that has now become apparent, as it is getting sunnier. This antihistamine causes photosensitivity and what I know of chemically-induced photosensitivity is that it abates a few days after the responsible agent has been metabolized, but that is perhaps not always the case with all such agents, as I only have experience with Doxycycline. There may be multiple ways that photosensitivity can occur. I can imagine the theoretical possibility that the Alimemazine has caused certain long-living chemicals that cause photosensitivity to accumulate into the skin. Some compounds never leave the skin - think of Argyria - so I'd permanently cease the use of anything with photosensitivity in their list of side effects. And wait a few years, see if it gets better with time. I think it is rare to take this substance for such a long time so it would be very difficult to find anyone knowledgeable about this. You mean you've not disinfected the roller when you used it for the first time after unpackaging? That should not be a problem. Also, I am quite sure that a skin infection does not manifest itself like that. We consider it impossible that anything breaks off the roller and ends up in the skin. The needles certainly can't splinter, fragment, flake or break off. I have to say that you are a totally unique case so far, amongst our thousands of customers. I just got a reply from my knowledgeable aquaintance and he says he can't help with this, but that you would need to see a dermatologist.. If a dermaroller could cause such permanent skin problems then it should have been reported before. We sold perhaps twenty thousand dermarollers over several years worldwide and you are the only one reporting this problem so I also think there is something going on that needs a dermatologist's judgment. You could have some rare skin issue. This problem needs the opinion of a medical specialist. Since you live in Norway/Sweden (I forgot which), you can see a dermatologist for a small fee, correct? If one dermatologist doesn't know, perhaps another one will - you need a second opinion or an expert's opinion. Since you want to improve the texture of the skin on your face, neck and chest, neither single needles, nor a dermastamp are suitable for that. You need a dermaroller. And because you have sensitive skin, use a 1 mm roller. Try it on a small area of your chest for example. The redness from dermarolling will disappear within hours. I am not a doctor so I would have to do the same as you (Googling) to find sleeping aids that do not list photosensitivity amongst their side effects. I can think of several reasons why microneedling could aggravate chemically-induced photosensitivity (before, during and after), all of which are rather technical and are beside the point, being that you are reporting what appears to be chemically-induced photosensitivity. I know how terrible photosensitivity in the face is. I have been since 2001 on Doxycycline because it very slowly makes my Lyme disease better and even ten minutes in moderate sunshine makes my face very painful and red for days. The only way I can get a suntan or expose my face to the sun is when I stop the Doxycycline for at least 24 hours prior. From your questions I gather you're sceptical that Alimemazine could be the cause. But what you described made me think of photosensitivity, and indeed, you say you've been taking something that causes photosensitivity for the past two years. Occam's Razor says that this is your prime suspect. You also mentioned that your problems already occured before dermarolling. So I think you should stop taking Alimemazine and see whether things improve. OK, but then my suspicion that you're on some kind of medicine that makes skin photosensitive is correct, and you have to look in that direction. The Alimemazine you're taking is known for making the skin photo-sensitive so I would recommend stopping it immediately. "Photosensitivity" is quite of an euphemism, really. "Photosensitivity" means that very harmful things occur in the skin when exposed to light, caused by the formation of highly toxic compounds. The skin then reacts in various ways. If you've been taking this drug for the past two years, then you may have developed increased sensitivity to its chronic exposure. Agents that have photosensitivity as their main side effect are of course the prime suspect in your case. "Alimemazine can make your skin more sensitive to sunlight. Keep out of direct sunlight while taking this medicine." I am near-100% certain that the skin symptoms you report have nothing to do with microneedling. No, the facial nerves lie very deep and there is no way a 1.5 or 2 mm roller can cause nerve damage - not even with very thin skin and pushing as hard as you can. I will think about your case and see if I can come up with something. I have not heard of similar cases in medical literature or from our (many thousands) of customers. It seems like an allergy/sensitivity/autoimmune issue of some kind but I am not a medical doctor - just trying to find an angle warranting further investigation..